Shakeology Ingredients - What's In This Stuff? - I Was SHOCKED! Shakeology Ingredients – What’s In This Stuff? Are you wondering what’s in Shakeology? Do you want to see the actual Shakeology ingredients list that is on the label of the bag? If so you’re in the right place… Keep reading! After hearing these reviews, I was still skeptical, but I have an open mind so I decided to do some research and check out the Shakeology ingredients for myself and see what the heck was in this stuff (and to find out the reason for the hefty price tag). SEE ALSO: Shakeology Samples – Try Before You Buy! I discovered that Shakeology was much more than just a “protein shake”, which is what I originally thought. I discovered that Shakeology was packed with over 70 whole food all natural ingredients that had amazing health benefits. I discovered that Shakeology was a superfood health shake. 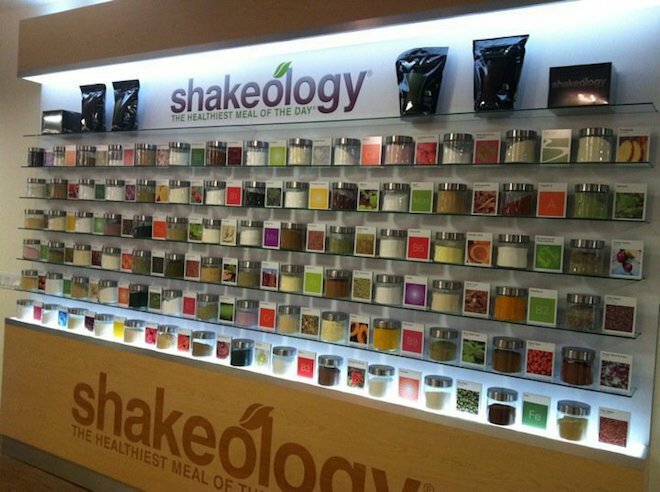 Shakeology Ingredients At Beachbody Headquarters In Santa Monica, CA. On paper it looked legit, so I decided I would give it a try, but more on that later. Now, lets talk about the Shakeology ingredients. First and foremost, Shakeology contains NO artificial sweeteners, flavors, fillers, or preservatives. Studies show protein for breakfast can help reduce afternoon cravings for sweets. Shakeology’s nourishing protein blend includes superfoods like sacha inchi and flax that also contain fiber. Shakeology’s proprietary protein blend can also help build and repair muscles, , support healthy blood sugar levels (as measured by HbA1C), and support healthy skin, hair, and nails. The superfoods in Shakeology go beyond meeting basic nutritional needs. They are sourced from around the world, including camu-camu which contains phytonutrients and Lycium Berry (goji berry). These superfood ingredients provide the body with vitamins and minerals, support a healthy immune system, and help fight free radical damage. Shakeology has fiber, natural prebiotics, and probiotics, like yacon root and bacillus coagulans that provides “good bacteria” to help support digestion and help keep you “regular.” This blend of ingredients helps to gently eliminate waste from your digestive system supporting healthy digestion, regularity, and nutrient absorption. In the video below, hear from the co-creator of Shakeology, Darin Olien explain what Shakeology is, and what some of the benefits of the superfood ingredients are. Shakeology comes is 7 different flavors (2 are Vegan), and each flavor has a slightly different list of ingredients. Below are links to the actual Shakeology ingredients that are listed on the back of each back. If you looked at the full Shakeology ingredients at the links above you saw that there is a lot of stuff in these shakes. It’s a “complex” product and it’s not easy to fully understand it and all of the benefits it has just by reading the label. My recommendation to anyone that is curious about learning about Shakeology is to simply try it out. It comes with a 30 day “empty bag” money back guarantee, so there really is no risk. If you don’t like the taste, or aren’t seeing results, or it makes you sick, or for any reason at all you decide you want a refund, you can send it back and get a full refund of your purchase price… no questions asked! I recommend drinking Shakeology every day for 90 days, and then make a decision. 90 days will give you some time to receive the full benefits. Remember, Shakeology is not a stimulant. It’s not like caffeine or an energy drink. You won’t take a sip and feel immediately different. Just like if you were to eat healthy food, it takes some time before you will notice a difference. Like I mentioned at the beginning of this post, I was skeptical of Shakeology, but after doing some research, I ended up giving it a try. After the first sip, I was hooked. It tasted great, which surprised me. I was expecting it to taste awful and to have to force it down. Typically with products like this, we don’t drink them for the taste, but are willing to chug it down for the health benefits it contains, but Shakeology is delicious, it’s like a treat! After a few week I love the way Shakeology made me feel. I drank it in the morning (shortly after breakfast) and it kept me feeling full all morning. Shakeology curbed my craving for sweets. Long story short, I’ve been drinking Shakeology daily for almost 7 years. I love the way that it makes me feel, it’s super convenient, and my body starts to crave it if I miss a few days because I ran out, or forgot to bring it on a trip. Have a question or comment?...Leave it below, I would love to hear from you!